First: If you haven’t read Cashore’s previous two books, you should. Seriously. Like, right now. I’ve been waiting three years for this book. Three years of following Kristin Cashore on her blog, waiting patiently, hoping that Bitterblue will be as wonderful as Graceling and Fire are. So, obviously, my expectations were high. It’s eight years after the death of Bitterblue’s (completely insane, cruel, wicked, evil, horrible, terrible, there-isn’t-a-word-strong-enough-to-describe-his-atrocities) father’s (justifiable) murder. She’s been queen since she was 10, surrounded by advisers that her uncle (the king of Lienid and Po’s father) picked. She’s been moving paperwork, treading water. And now, she’s beginning to wake up, for lack of a better word. She wonders what goes on outside of her castle, and starts sneaking out at nights. There she learns that she’s not the only one who is having trouble putting Leck’s atrocities behind her. It’s all over the kingdom: her people are not well people, and those who are searching for truth are being harassed and murdered. However, realizing this is not the end of the story: it’s only the beginning. This book is very much one of healing, of getting past a tyrant (a mild way to put it) and his terrible past, and finding a new path of Truth and Justice, while acknowledging that the abusers were in so many ways victims, too. When I logged that I read this one on Goodreads, I started scrolling through the reactions of people there, and I discovered two things. One: you’ll either love or hate this book. Two: It seems to me that the complaints boil down to just a couple things. First: there isn’t enough Katsa and Po, and they’re different. True, Katsa and Po aren’t the main characters of this book, but they do play a role. (Also: of COURSE they’ve changed. It’s been eight years people!) In fact, sometimes I felt that Po was too much of a fallback for Bitterblue, and I was actually glad the times in which he wasn’t around, and Bitterblue was forced to do things on her own. That said, there are really two storylines going on here, and our heroes from Graceling do play a major part in the second one. Also: Bitterblue’s romance isn’t full of chemistry, but is rather a slow one, in which they are friends first. However, it’s also not one that can go anywhere. That said, my favorite character was Giddon. I don’t remember him well from Graceling, but I adored him in this book. He was such a rock, such a kind, good-hearted individual, that I couldn’t help like him. Which brings me to point number two: Cashore is so heavy on women that she doesn’t cut men a break. (Though one person said they didn’t like the way Cashore treated women, and to that I have no answer… REALLY?) I don’t understand this. There are strong women in this book, strong men and weak men and traitorous women. It’s all there. One of the things I think Cashore does best is portray the spectrum of human possibility: it’s possible for people to lie for good reasons. It’s possible for people to be in love and fight. It’s possible to trust people and then be betrayed. It’s possible for healing. It’s possible to find good women and men to surround oneself with. Complaint three: it’s long, boring, complex, confusing. Well, yes. I think that’s done on purpose: Bitterblue is confused — warped by her father’s actions, which still have a hold on her, her advisers, and the country — trying slowly to work things out, and we see events through her eyes and memory. It’s not an easy process, and therefore to have a straightforward book would not do Bitterblue and her story justice. It’s very much like Chime in this: Bitterblue is not always the most reliable narrator, because she doesn’t have all the pieces, but to tell the story any other way would lessen the impact of the revelations at the end. I’ve blathered on too long. The short version of all this: Bitterblue is excellent. One can only hope that Cashore doesn’t take three years writing the next book. I need her stories. I agree. I thought one of the most daring things that Cashore did was tell the story from the perspective of a non-Graced individual. It gave me a little insight to what it would be like to live in this world, constantly trying to keep up with people who know more and have more skills. I hope she has already started book four! i'm glad you liked it — i've heard some of the complaints but i'm looking forward to reading it anyway! Miss K: I didn't even think of it from that perspective! You're so right. It was daring — especially considering Graceling and Fire — and incredibly necessary for the telling of this story. Alysa: I do hope you like it! Thanks for sharing your thoughts. I'm about 3/4 of the way through this book, and it's killing me that I can't just sit down and read it straight through (for various reasons). 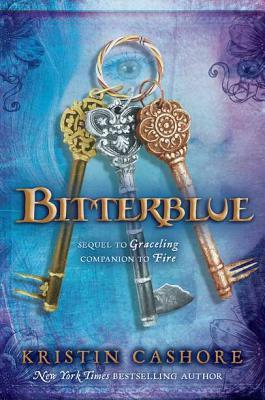 I'm going to reserve my conclusions to the end, but I will say that Bitterblue made me want to re-read Fire (more so than Graceling, for some reason). More thoughts later… But I'm certainly with you in hoping that Book 4 (and 5 and 6) will be on the way. I think it made me want to revisit Fire (as well) for two reasons: one, because I remembered it less than Graceling, and two, because Katsa and Po are such prominent characters in Bitterblue. I'm looking forward to seeing what you thought of it, Jen!